I had one that was a hand me down from my aunt. Our dog had carried it around and her head was all scratched up. We had to stuff her head with cotton because her eyes had begun to sink in... she was a mess. But I loved that doll. Sadly, lost her in my aunt's house fire. Remember getting my Betsy Wetsy from the neighborhood corner candy store. 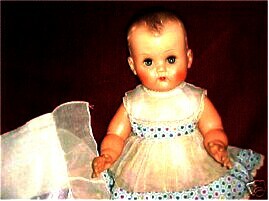 I am thinking I was 6 years old and I kept that doll forever, she kind of melted up in the attic about 40 years later.